Friday, November 27, on WEtv. Premiere episode watched for review. “Everyone in Charleston likes a good ghost story,” Reverend Elijah Bledsoe (Lamman Rucker) tells Maria Abascal (Mena Suvari), explaining how local gossip led him to her temporary home in a trailer park. South Of Hell’s setting is its strongest feature, and the show acknowledges it: The premiere episode relies heavily on cuts from its exposition-heavy story to a picturesque landscape, composed of stately Southern homes draped in mist, Spanish moss hanging in the trees, and swampy sloughs unfortunately symbolic of the foggy, mired-down slog of the show itself. Though Maria’s homecoming elicits haunting memories of her father, she’s come back to Charleston with a mission: To locate the relic that might free Maria from the demon that’s hounding her. That demon, Abigail (Kayla Cromer), has an appetite for other malevolent spirits that allows Maria and her brother David (Zachary Booth) to eke out a living as low-rent exorcists. It’s a literal appetite, and when Maria manages to choke a demon out of a client, it wriggles from the afflicted woman’s mouth in the shape of a squirming tentacled blob that Abigail chomps on with relish. Appropriate to the setting, her meal looks something like a supernatural catfish. Almost everything else in South Of Hell is equally literal, over-explained, and overworked. Exposition is delivered by voice-over, in a dream sequence (in which the dreamer yells, “This is a dream, this is a dream!”), and in dialogue where characters reiterate tidbits they both already know. Maria imagines her father imploring her, “I just want my family back again: you, me, and your brother, David,” as if either of them needs reminding of who “your brother” refers to, especially when seconds before, Suvari has established his name and relationship to her character. Neither is this show. In the premiere episode (directed by Eli Roth), even an ambitious fight scene suffers from poor execution. As two demons wrestle and grapple in defiance of gravity, bouncing off the walls and ceiling of a tiled cell, quick cuts and close framing make what could be a stand-out set piece into a claustrophobic series of blows and grunts. Much of the action in South Of Hell is unintentionally funny, like when Jeremy’s demon emerges on stage at an evangelist’s healing service. The boy’s jaunty bowtie and the clumsy visual effect of the demon’s bright eyes make Wenzel look more like an evil ventriloquist’s dummy (so, a ventriloquist’s dummy) than a child tormented by possession. Despite some valiant posturing by Suvari in Abigail’s first appearance, her presence is similarly doll-like. Abigail can take over Maria’s body, a change signaled by her unnaturally bright eyes, but sometimes she materializes as a better-coiffed, perfectly made-up double of her host, a conceit that allows for limply grotesque eroticism as the demon strokes the sleeping Maria, who writhes and gasps. And it’s not just demons who perform sexual violations, or whose motivations are muddled. David’s heroin dealer (David has a drug problem, which the audience is reminded of several times) simultaneously taunts his customer with sexual blackmail and the threat of castration, a combination that seems both counter-productive and cartoonishly villainous. Touches of Southern gothic in the settings are effective, if overblown. At Jeremy’s home, Maria’s tentative exploration takes place against a modern backdrop of dinosaur silhouettes peppering the wallpaper; she opens a carved wardrobe to reveal a dainty toile print of a landscape dotted with figures. It’s a busy, overpopulated room in an otherwise spacious, colorless home, and its clashes of style make the whole scene feel off-kilter—much more so than the obvious touches of destroyed toys and shredded posters on which the camera lingers. Later, Maria walks down a cobblestone street, mist swirling around her, as figures begin to turn toward her in the dark. It’s the most chilling scene in the premiere, eschewing the lurid yowls and grimaces of possession for quiet menace. These glimmers of promise don’t redeem South Of Hell. Too often, the premiere is plodding where it could be exciting, silly where it could be scary, and prurient where it could be perverse. It repeats its plot points and relationships tediously, never trusting the audience to pick up a hint. 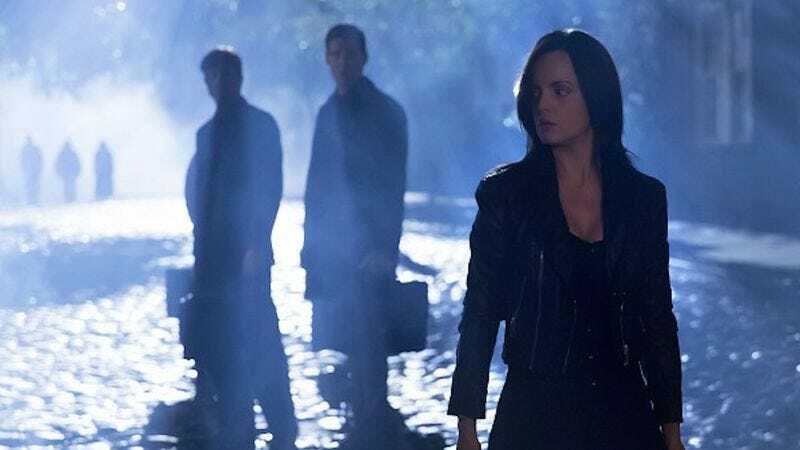 All seven episodes—including those from directors Ti West, Jennifer Lynch, and Rachel Talalay—will air back-to-back in a Black Friday marathon, and unless subsequent episodes improve, a marathon is exactly what it will feel like. Maria’s search for the salvation offered by The Eye Of The Everlasting is just beginning, but after one episode, South Of Hell already feels like an everlasting slog.